The Albany Sonic Arts Collective presents Sublime Frequencies, film screenings and rare 78rpm records from around the globe from Ian Nagoski and Robert Millis. Rare and unseen Sublime Frequencies (www.sublimefrequencies.com) films will be screened, with the director in attendance. This very special night will appeal to music lovers, film buffs, world scholars, those interested in South Asia, history fiends, and anyone with an eye for the beauty of uncovered cultural treasures from around the globe. I wrote about Ian’s last visit to the Capital Region here and look forward to hearing him again. Sublime Frequencies’s releases have provided consistent inspiration and enjoyment, particularly Radio Sumatra. Someday there will be a book on James Tenney, who studied with Varese, befriended Ruggles, argued with Partch, made psychedelic eletcronic music with Mort Subotnick, played in the ensembles of Steve Reich and Phil Glass, taught alongside Harold Budd, and taught Peter Garland, Larry Polansky, John Luther Adams, and Michael Byron, among many others. 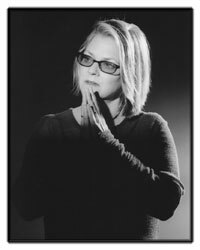 Tenney is a line wandering through American musical history, drawing a variety of unexpected connections. The people most central to American music, those who can’t be pulled out of the fabric without it unraveling, are not always the household names. I find Ashley’s ‘eventfulness’ formulation to be useful. I’ve often thought of my music’s tendency toward uneventfulness (here here and here, for example) as related to landscape, particularly landscape painting or photography. My interest in field recordings and soundscapes both grows from that predilection and informs it. 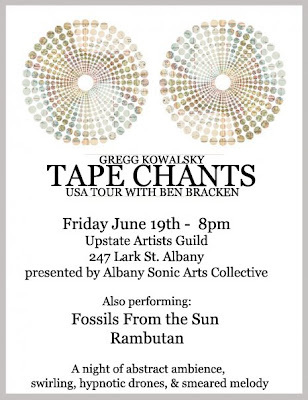 The Albany Sonic Arts Collective presents Gregg Kowalsky and Ben Bracken from Oakland, California. Gregg will be presenting his Tape Chants project which involves sounds from cassette players distributed throughout the performance space. Tape Chants has just been released on Kranky Records. Also performing are Fossils From the Sun (Ray Hare solo project) and Rambutan (Eric Hardiman solo project).